As a frequent Botleys Mansion florist, we have had the opportunity to try out quite a few beautiful wedding flowers looks, and loved every one of them, but I particularly enjoyed arranging the flowers for this particular wedding due to its stunning, bold choice of colours. Natalie’s main colour, as for the bridesmaids dresses, was a lovely and very on trend coral. But she really didn’t want this to become a pale ivory, creams and coral wedding, opting instead for a dramatic injection of deep purples, fuchsia pink & red, and even lime green. 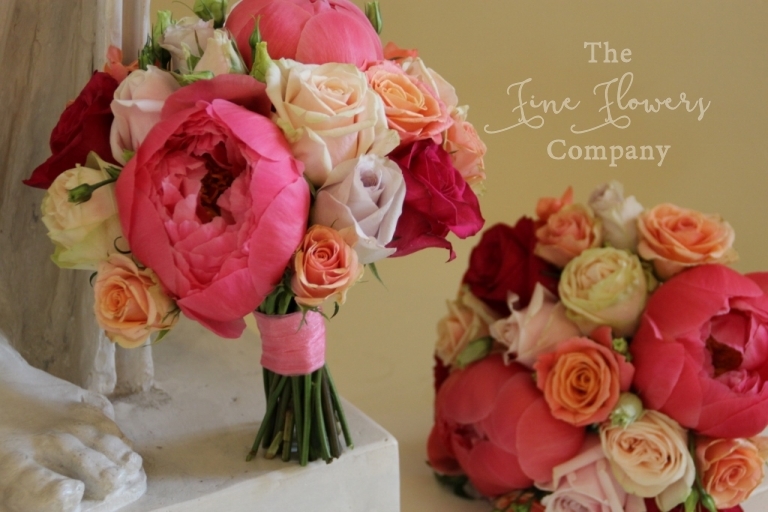 Natalie’s bouquet and her bridesmaids bouquets all used coral paeonies and peachy coral, fuchsia pink and creamy roses, to complement the bridesmaids coral pink dresses. The injection of colour stepped up dramatically when it came to the venue flowers and centrepieces. For the wedding ceremony, we created a really dramatic line up of tall spring inspired displays down the aisle, using silk cherry blossom with a bright collar of colourful hydrangeas in pink, purple and green. For the front of the ceremony room, we created a dramatic backdrop with two colourful urn centrepieces. The modern silver urns coordinated so nicely with the elegant silver flutes used down the aisle, and really showed off the stunning flowers colours. 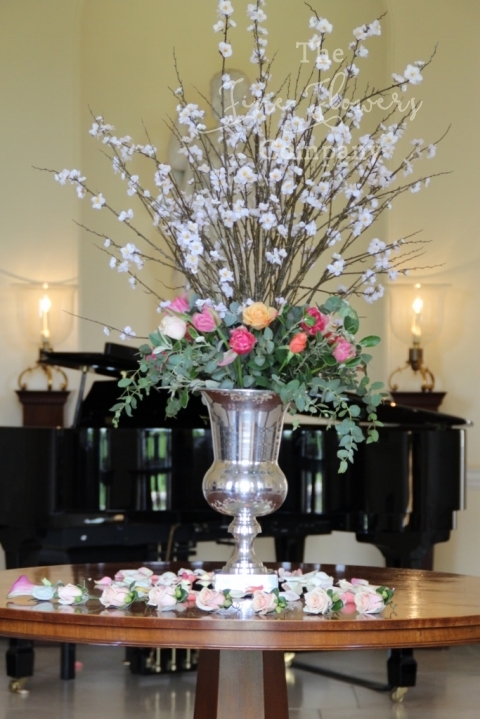 A line up of little vases with summer bright posies also decorated the ceremony table and the mantelpiece. All these ceremony flowers were later on moved by Natalie’s hands-on friends and reused downstairs to dress the atrium for the wedding breakfast. The tall fluted vases from down the aisle, surrounded by the small posies in silver vases, were used to dress some of the guest tables. The rest of the guest tables were dressed by lavish cube vase centrepieces bursting with colourful hydrangeas, roses, lisianthus, coral paeonies and lime green vibernum pompons. The top table was styled with the bridesmaids bouquets placed in matching small mercury glass vases. Overall a lovely and different look for spring, bursting with joie de vivre, just perfect for the season! Here are some more beautiful wedding photos from this lovely and bright end of spring wedding at Botleys Mansion. 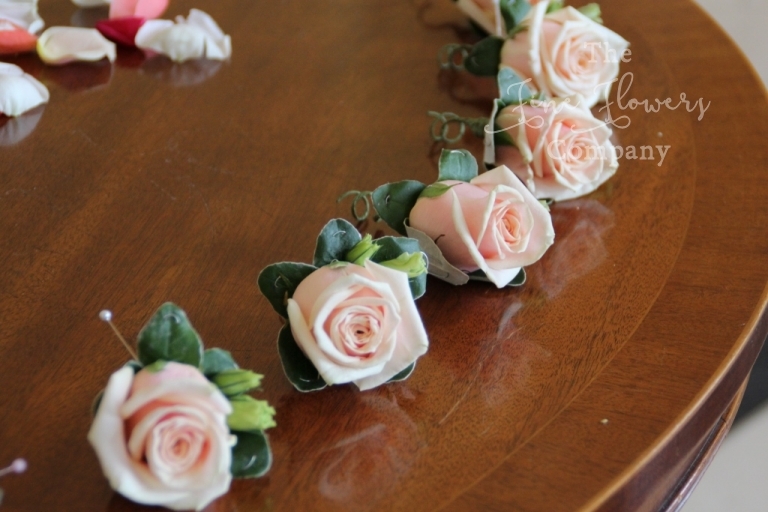 If you are looking for a Botleys Mansion florist for your wedding, please take a peak and find lots of ideas, on the many featured weddings flowers blogposts on the Botleys Mansion venue page. You’ll be able to take some inspiration at different colour schemes and styles of displays which suit this gorgeous venue. 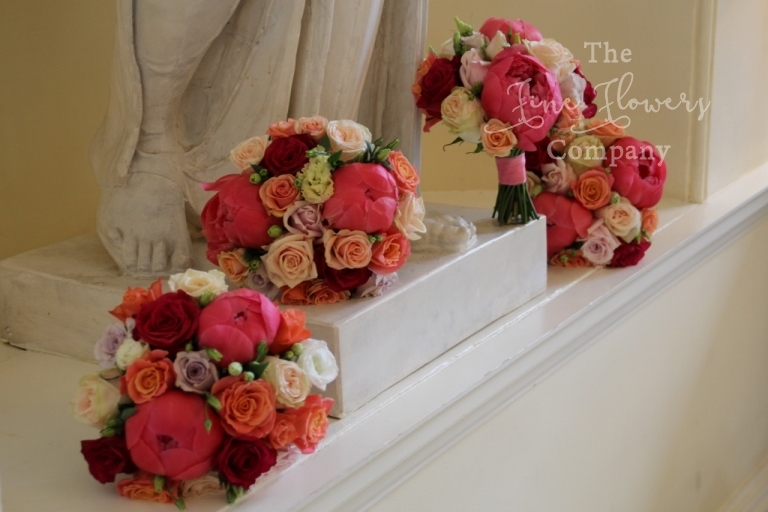 We are very local to Botleys Mansion and we can help you plan beautiful wedding flowers for your wedding.